It's the benchmark for the ANH helmet, IMO. It has "the look" from every angle....love it! 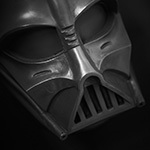 Hey DJ, if you read this, would you be kind enough to post some photo's for all us Vader nuts to drool over. Totally agreed. I've been bugging him for the last few years to consider a short run. ...and I'm doing it again! Paint stuff!! Was going to add this - to get that shiny/ not shiny effect on this helmet I mentioned before that I used a Turtle Wax product. After not doing Vader heads for the longest time I started getting back into it of late and was looking for that Turtle Wax paste I used for the DJ and it is simply called "Rubbing Compound" - it is stated to be a kind of cleaner and is an orangy brown paste. But "Rubbing Compound" and comes in a hockey puck container. If you are painting a head and wait 7 days for your paint to dry, test out some of this on the dome (or a practice dome surface!!!!!) to see the effect. To get off the residue when done, I simply use dishwashing soap like Dawn. Wait. What short run?!!! Lol!!! I would be all over that helmet! I missed out due to funds back in the RPF days! I just joined here and it already so nice to see people that I remember!